A few weeks ago, store someone got to my blog by searching “Doctor Who vs. Angelus.” I had never even thought about a post on that topic, sovaldi but now I’m inspired because that is the perfect topic for a Whedony-Whovian geek to ponder. So here it is: The Official Doctor Who vs. Angelus post. I’ve decided to consider three scenarios – what if Angelus met up with the 9th, 10th, or 11th Doctor? Now I’m not saying that he would encounter all three, but rather, what if Angelus came up against the 9th Doctor (Christopher Eccleston) OR the 10th Doctor (David Tennant) OR the 11th Doctor (Matt Smith)? Doctor: You think it’ll last forever. People and cars and concrete. But it won’t. One day it’s all gone. Even the sky. My planet’s gone. It’s dead. It burned like the Earth. It’s just rocks and dust. Before its time. The Doctor is a scarred and angry timelord. He survived the Time Lord war, but now is the only Time Lord left in existence. And yet, he is just beginning to let people in again. He teams up with Rose and begins the process of letting someone “in” to his life. The Doctor and Rose meet Angelus in the 1860s shortly after Angelus had turned Drusilla. 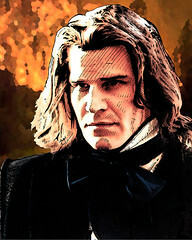 Angelus did more than turn Drusilla into a vampire, he first turned her insane by tormenting her and killing her family. Fresh off of that “triumph”, Angelus is seeking his next conquest. The Doctor and Rose arrive, as is usually the case, unintentionally. The Doctor was planning to take Rose to the 1960s but missed it by a century. Angelus spots the Doctor and Rose in a tavern, and is intrigued by the power and confidence the Doctor exudes. He stalks them for several days, leaving a trail of bodies conspicuously in the path of the Doctor so that he is forced to investigate. Angelus kidnaps Rose and holds her hostage to torment the Doctor. When the Doctor comes to rescue Rose, Angelus kills her spectacularly in front of the Doctor. The Doctor loses it, and flies into a vengeful rage. He decapitates Angelus, but before he disintegrates into a pile of dust, Angelus smiles knowingly. He succeeded in turning the Doctor into a dark, angry, soulless Time Lord who will never again seek out companionship or volunteer to save humanity. The Doctor leaves earth, never to return. He never takes another companion. Pleas for the Doctor to come and help planets in need go unanswered. The Doctor doesn’t care. He is not a hero. And to ensure that he will never again help, he destroys the TARDIS with no shred of remorse. You need to get yourself a better dictionary. When you do, look up “genocide”. You’ll find a little picture of me there, and the caption’ll read “Over my dead body”. ~The Doctor, episode 4.6 The Doctor’s Daughter. The Doctor and Donna are traveling when the Tardis breaks down and they land in California in 1998. Angelus has returned, having been de-souled after having succumbed to the teenaged-passion of Buffy. Jenny Calendar has been killed. 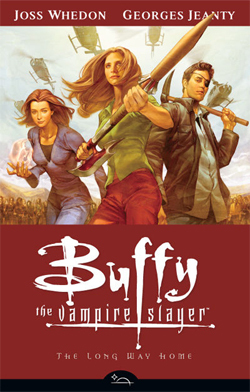 Buffy and her Scooby Gang are attempting to come up with a plan to beat Angelus while at the same time balancing the demands of high school life. The Doctor and Donna come across Angelus feeding on Theresa, who will deliver a message from Angelus to Buffy when she rises as a vampire. The Doctor rescues Theresa, and Donna exclaims in typical Donna-fashion that she can’t believe that vampires are really real. Angelus escapes, but the Doctor takes up the mission of tracking him down. Two nights later, Angelus tries to kidnap Donna, who refuses to be a damsel in distress and does her best to fight him off. The Doctor arrives, to see Donna pulling a vial of holy water from her pocket and throwing it at Angelus. The Doctor is impressed with her quick thinking and asked her where she got the holy water. She replies, in her typical flippant matter, that she has seen Dracula movies and since vampires are actually real, thought it would be prudent to arm herself. Angelus, slightly singed from the holy water, turns his attention to the Doctor. The Doctor barely flinches, steps one step to the left, causing Angelus to fall forward, impaling himself on the white picket fence that was directly behind the Doctor. Buffy and the Scooby gang never find out what happened to Angelus, and assume that he must have left town, even though that would have been out of character for him, as he was dead-set on besting the slayer. The Doctor and Donna leave in the TARDIS to travel back to the 1920s to meet Agatha Christie. It’s 1894 and Angelus, having been imprisoned by the Immortal, is on a rampage through Italy, angry that the Immortal had (successfully) seduced Darla and Drusilla. The Doctor and the Ponds have arrived in 1894 looking for the opportunity to rest after the chaos of trying to vacation on Apalapucia. The Doctor declares that he wants to take them back to Victorian London. The TARDIS, instead of dropping them in 1894 London, drops them in 1894 Rome, which Rory declares is not funny given he spent two thousand years as a Roman centurion. The Doctor swears he wasn’t trying to be clever, and that he really must get around to adjusting the geo-locator on the TARDIS. The Doctor evades Angelus’ attacks by running and leaping about, looking rather like a hyperactive walking-stick, while the Ponds grab whatever makeshift weapons they can. Amy holds a broken piece of window lattice that is shaped like a cross, and Angelus shrinks back snarling. Angelus throws a heavy book at Amy, shattering the lattice, and advances toward her, saying “You think you have a chance against me? I was slitting throats when Frederick the Great was invading Prussia!” A heavy blow strikes Angelus on the back of the neck, and the return stroke sends him flying head over heels. Rory stands over Angelus, holding a table leg as a club: “And I was slitting throats when Emperor Trajan was invading Northern Thrace.” Amy has one of her rare moments of genuinely appreciating Rory. The moment, however, is short-lived, as Angelus lashes out, shattering Rory’s shin with a vicious kick. As Rory crumples (wishing that he was still made of plastic so that wouldn’t have hurt as much), Angelus backhands Amy across the room and swipes up Rory’s club. The Doctor, finally outraged enough to take decisive action, adjusts his bow tie and looks very cross. As the Doctor begins a stern speech about how he, the Last of the Time Lords, scourge of the Daleks, besieger of Demons’ Run, bane of the Cybermen, will stand for no more, Angelus furiously bashes him over the head repeatedly, decorating the walls with Gallifreyan brain matter. Angelus stands over the doctor, enjoying the sight of blood and carnage. Suddenly, a length of wood protrudes from his chest as Amy impales him from behind with a chair leg. With a shocked expression, Angelus collapses into a cloud of dust. “It turns out I suddenly find myself needing to know the plural of apocalypse.” ~ Riley, sale Buffy the Vampire Slayer. It’s interesting how often the shows I watch deal with the theme of apocalypse. Maybe I have some sort of fascination with the utter destruction of humanity, but that’s beside the point. The theme of apocalypse is a powerful tool for storytelling. The Whedonverse is, of course, obsessed with the apocalypse. Whether it’s Buffy and the hellmouth, Angel taking on Wolfram & Hart, Echo dealing with a post-apocalyptic world brought about by the Rossum corporation, or Cabin in the Woods ending with an ancient god rising after the annual sacrifice failed, the end of the world is pretty much nigh in Joss Whedon’s world. (Even when Joss goes mainstream, like with The Avengers, the apocalypse is right there). But it’s not just the Whedonverse that is apocalypse-heavy. Look at Doctor Who. How many times in the seven short years of this new series has the Doctor and his companions worked to avert the end of time? At least once a season, but often more, especially during the David Tennant years. All of this has got me thinking about how the nature of humanity informs and influences the nature of the apocalypses presented. 1) It’s not humanity’s fault. In this case, the apocalypse is brought about by outside forces, be it aliens or demons depending on the show. Humanity becomes either merely an innocent bystander who is largely unaware the imminent danger (think Joyce through the first two seasons of Buffy, or also Xander in the episode “The Zeppo.”), or they become the reason why the heroes fight. In the latter, humanity is precious, special and good and should not be wiped off the face of the earth. Thus, in Doctor Who, the Doctor speechifies quite a bit about how earth and humanity are important. The best example is at the beginning of Matt Smith’s tenure as the Doctor, as he’s telling the Atraxi to not mess with earth, and the image of all the previous doctors flash on the view screen of the alien menace. 2) It’s humanity’s fault. In this case, humans are directly responsible for the resulting apocalypse. In Cabin in the Woods, after two victims of the annual ritual sacrifice survive and discover that they were manipulated to their deaths by an elaborate underground organization that sacrifices 5 young people every year using the gruesomest means possible. Now of course, there could be some sympathy for the office grunts behind this, as they are merely appeasing the ancient gods who threaten to rise and destroy humanity otherwise. But as Joss Whedon aptly summarizes on the commentary, sometimes “people are more important than humanity”. Another example can be seen in Dollhouse. Here, the world faces it’s apocalyptic future because people get greedy about being able to have the ability to be imprinted on any body they want and live forever. In either scenario (not humanity’s fault/humanity’s fault), the primary motivator is the need for power. The alien, demon, or people who bring about the apocalypse usurp control that was not theirs to have. As well, in either scenario, humanity is on the brink of complete destruction. True, that in Dollhouse, for example, the good guys win, and find a way to undo the “wipes”, humanity has definitely been devastated. The Christian apocalypse is quite different. First, we live in a tension as to the nature of humanity. Humanity is God’s good creation, precious and loved, but at the same time it is fallen and corrupt and tries to seize control and power it does not have. Humans are free and have responsibility and will be judged for their actions and inactions. Second, the Christian apocalypse is not about some god trying to seize power and control. Instead, the God of the universe, the God who created humanity, loved it and called it good is ultimately in control. He doesn’t usurp power, and he doesn’t unlawfully subjugate humanity. God does not have to swoop in like the Doctor who was visiting another plane unaware of what was happening on earth and at the last possible minute try to fix everything. God decrees and knows, and proclaims to us how it will end before it has even started. Indeed, and here is the biggest difference, the Christian apocalypse is primarily redemptive. The Christian apocalypse is not about utter and total destruction. The earth and humanity will not be left in ruin, where the survivors are left alone to somehow bravely rebuild their lives. True there will be judgment (and violence). But even that judgment is redemptive. Earth will not be some burning desolate rock floating in the universe for the rest of eternity. Instead, the apocalypse brings about a new heaven and a new earth. Through the power and blood of the Lamb, sin that has infected and corrupted humanity will be eliminated. And the people of God will live in resurrected glory. The Christian apocalypse is not about hope of an ethereal life in heaven. The Christian apocalypse is about the hope of a physical, redeemed and resurrected life on earth. It’s about restoration to God’s intended purpose for humanity. It’s about reclamation wherein God reclaims his good creation from the grasp of sin. The promise of a crown of life. A call to repentance and to worship. The song “Praise Yahweh” being sung by the multitudes. The victory of the Lamb who vanquishes all evil. A holy city, a new Jerusalem contrasted with the unholy city of Babylon. A return and restoration of Eden. Emmanuel, the king who promises to come quickly for his beautiful, sanctified bride. “Justice doesn’t work like that. You don’t get to decide when and how your debt is paid.” ~ Doctor Who, sildenafil A Town Called Mercy.